Yesterday we went over the general benefits of Chic Sheep, and today I’ll talk about what I ended up knitting first! From my previous articles lately, you may be able to tell I’m on a shawl kick, so it makes sense that the first thing I’d knit with Chic Sheep is a shawl. 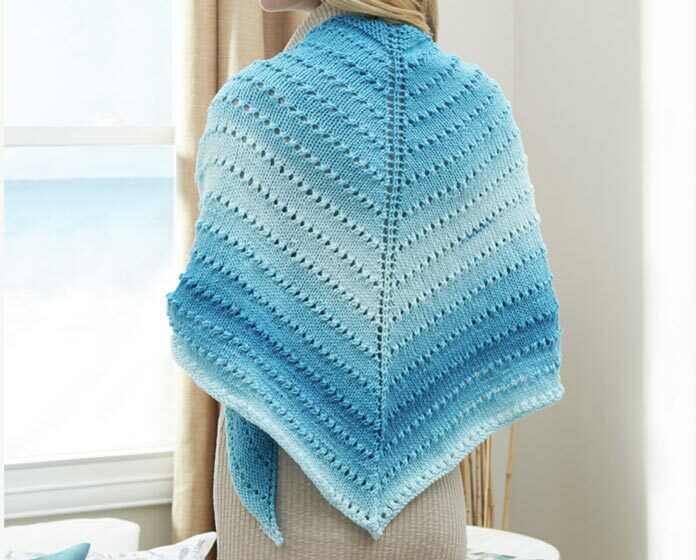 The pattern is named Simple Lace Triangle Shawl, it’s available for free on the Red Heart website. 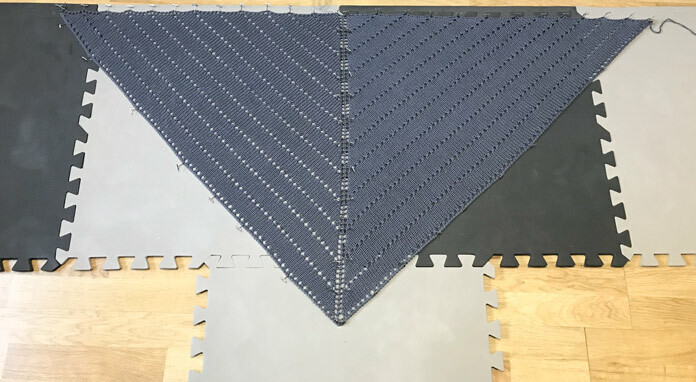 The lovely product photo of the Simple Lace Triangle Shawl. 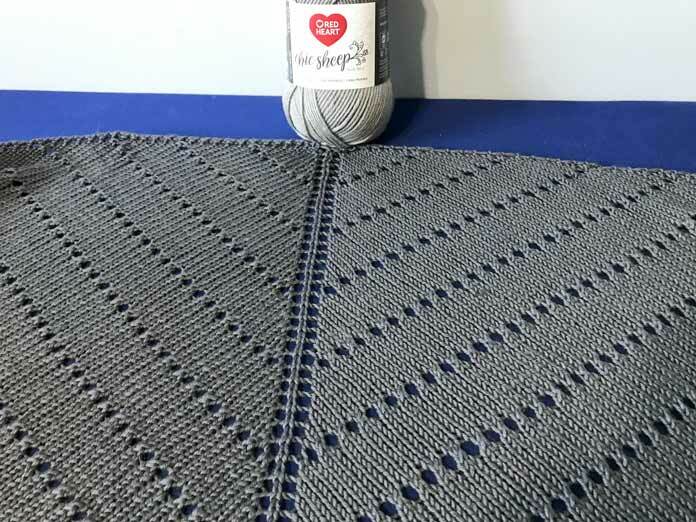 The shawl is originally written for Red Heart Super Saver Ombre yarn, but I chose it for this solid color because I think it will show off the stitches nicely. The eyelets and delicate lace of the pattern look amazing with the soft sheen of the natural wool. I was completely right, this pattern does an amazing job of showing how the yarn does with stitches and shows off the beautiful natural look of this fiber. Chic Sheep was a dream to knit with. It moved along the needles easily and never split. Not once did I have the issue of splitting yarn; even when I was knitting in a car in the dark. The knitted and blocked garment. Look at how beautiful those eyelets turned out. It helps that the pattern is very easy to memorize and alter. I did alter the top. There was a small triangle of garter stitch in the beginning, but I just made it stockinette because I have an unreasonable, undying love of stockinette. What? It’s a completely normal kind of psychosis!!! You could also weave in some other colors, for example, making each stripe between the eyelets a different color. I very seriously considered doing this, but really wanted to show off the yarn and pattern. I ended up nixing the idea because I thought it would have created too much interest, but it’s still in the back of my mind. Perhaps a future article will feature the Simple Lace Triangle Shawl pattern with more colors. Chic Sheep in the yellow color of Mimosa and the blue color Royal. I normally block all my knitting, no matter the fiber content. With 100% wool this step becomes non-negotiable. Tomorrow I’ll cover the reasons you should be blocking and a couple of different blocking methods you can use. It really makes a huge difference in the way your finished object looks. I’d highly suggest sticking around to read tomorrow’s post! My shawl blocking on my craft room floor. The Simple Lace Triangle Shawl pattern was an excellent pattern to really show off Chic Sheep. I’m so pleased with the way it turned out. After blocking, it looks absolutely perfect. The yarn was so easy to knit with and felt amazing while I was knitting it up. 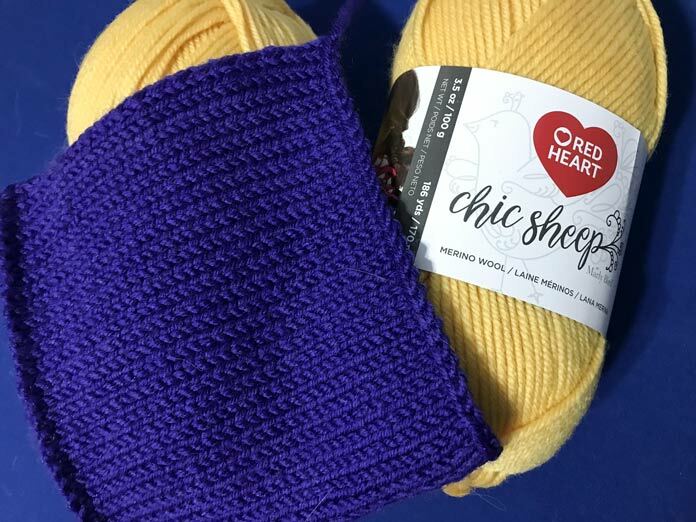 Chic Sheep is definitely a staple for any knitters stash. Go to part 3: Steam blocking a shawl knitted with Chic Sheep goes from good to great!